And Fries Has to Taste Bad? When you talk about low-fat meals that are a substitute for the traditional Burger and Fries almost no one thinks of sweet potatoes and ground turkey! Sweet potatoes are also considered a Thanksgiving holiday vegetable that, to kids and most adults is just too bland. But given today's health conscience society, it makes perfect sense to lower fats and cholesterol wherever possible. However, given our fight to reduce fat, eating less saturated fat and trans fats, sweet potatoes and ground turkey are now right out front on supermarket shelves as well as offered in many restaurants. Also, given the high popularity of home cooking shows, we are more accustomed to trying new and tasty meal substitutes over traditional comfort foods. While Chris and I prefer lean ground sirloin to turkey, every now and then we prepare our meals in a different fashion. From a nutritional standpoint, the fat content is about 1 gram for the sweet potatoes and approximately 3 grams for the turkey, so this is definitely a healthier choice, especially if you prefer red meat. The USDA has a wealth of information on nutrition to help you choose which foods to serve. Word of Caution.... Super Sizing is prohibited otherwise you just may as well eat a regular burger&fries! So try this alternative to the regular super-sized meal... you might be surprised just as we were, especially knowing the benefits of consuming less fat in your daily life. Clean the potatoes and peel if you prefer. Slice the potatoes into half-inch wedges, or strips if you prefer the french fry look. Mix the onion powder, garlic powder, oregano, paprika, cumin and cayenne pepper together in a small dish, then mix the olive oil and spices together letting them sit for 5 mins. Place potatoes in a large bowl then pour mixture onto the potatoes, covering completely. Place on a baking sheet lined with aluminum foil (easier cleanup). When oven has reached 450, bake for 30 minutes turning them at least once during that time. Pour can of spinach in a bowl or let the frozen spinach defrost in one. Drain water out using a colander. Chop dry oatmeal in your blender for 30 seconds. Pour oatmeal into a small dish then add the garlic powder. Remove yolk from eggs and discard leaving the egg whites. In a large bowl, mix all ingredients together with the egg whites as if you are making Louise's Meatballs. Shape into 4 meatball size patties (each approximately ½ inch thick). Grill patties 3-4 minutes each side until cooked through. 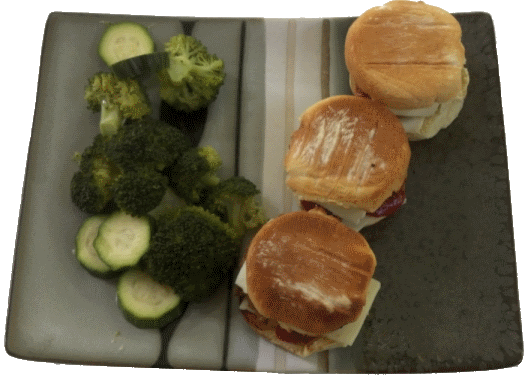 Low Fat Burger Sliders anyone? Spray a small amount of Pam in the pan on your gas grill prior to grilling. Adding the cracked black pepper while cooking enhances the taste. Make your meatballs smaller, and turn these into sliders. Your local market should now be carrying smaller rolls to accommodate the size. Add another side of vegetables such as green beans and you'll have a meal that everyone will enjoy. Extend the turkey or ground beef with an egg or two and bread crumbs for a moist great tasting slider. Add Parmesan cheese to the extended meat for that Italian taste. Serves 4 or 12 to 14 when preparing the meat with the eggs and bread crumbs. Try Louises Meatballs using Ground Turkey instead of burger. Not Interested in Low Fat? Try Some Italian Pasta Recipes! Return to Easy Everyday Cooking Recipes from Burger and Fries.